Was here from May 2013 to December 2014 during breaks. I learned many techniques to running a concert venue. Have shadowed stage hand, security, and marketing positions in addition to shadowing the general manager. 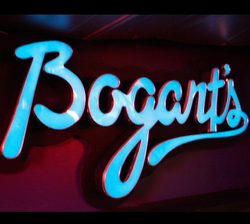 Bogart's has given me many opportunities during my time there, and the knowledge I've gained while working there will prove to be invaluable in the years to come. Blog run by myself since September 2013. Average over 100 views a day and have over 100,000 total views. This blog has not only taught me how to write more effectively, it has also given me some conflict-management experience. More than once on my blog someone has disagreed with my opinions and made it known on my blog in a very negative way. I've had to deal with these disagreements in a calm and collected manner, even if the opposing side is not as calm and collected. 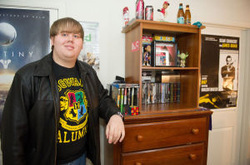 Click Here for the link to the newspaper article about Enter the Movies. 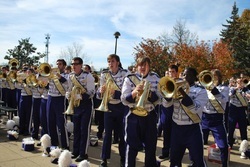 Was a member of the JMU Marching Royal Dukes from 2010-2013. This has given me lots of hands-on music experience. I think that, while it is important to have business knowledge in the industry, it's also important to have musical knowledge. The MRDs have taught me not just how to make music, but how to make music sound good. The MRDs are one of the best marching bands in the country because they play their music on the field better than anyone else. The MRDs have also given me many unique experiences, such as marching in the streets of London for their New Year's Day parade in 2011, or marching down the streets of NYC for Macy's Thanksgiving Day Parade in 2013. Click Here for a newspaper article about the MRDs taking over NYC.